Executing a perfect back flip is typically best left to a gymnast, or maybe a platform diver. But on Wednesday evening it will astronaut Dom Gorie's turn show us his stuff. Piloting the space shuttle Endeavour on final approach to dock with the International Space Station, Commander Gorie will nudge the shuttle into what's called the Rendezvous Pitch Maneuver, or RPM. 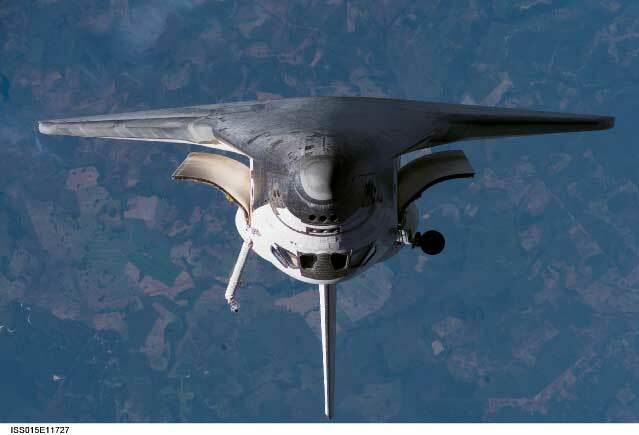 Check out a video of the STS-114 RPM here. Here's how it works: Ever since it launched early Tuesday, Endeavour has been on course to rendezvous with the space station on Flight Day 3. During the day on Wednesday, the shuttle crew will fire the shuttle's thrusters periodically to ease up to the station, approaching from behind and below. When they reach a point about 600 feet below the ISS, Gorie will start the maneuver on cue. It takes about 9 minutes for the entire 360 degree flip to play out. While Endeavour's underside is exposed to the ISS, station crew members will use digital cameras equipped with 400mm and 800mm lenses to shoot as many as 300 photographs of the delicate heat resistant tiles that cover the shuttle's belly. Those images will be downlinked to the ground later in the day, where teams of experts will pour over them, looking for any signs of damage that may have been caused by flying debris during launch and ascent to space. The technique was developed in the wake of the Columbia accident in 2003. An investigation board determined that debris hit that shuttle's heat shield during launch, cracking a gash in the wing. When Columbia reentered the atmosphere to land, searing hot gases seeped in, incinerating the spacecraft. Seven astronauts died. In the aftermath, NASA engineers made a number of modifications to both their hardware and their procedures. And so the RPM was conceived. It was first flown by Commander Eileen Collins on the STS-114 return to flight mission in 2005, and it has been flown on every subsequent mission. Here's a little gallery for you: STS-114, STS-121, STS-115, STS-116, STS-117, STS-118, STS-120, and STS-122. NASA TV will carry Endeavour's RPM live at 10:20pm Eastern on Wednesday, if you want to watch. The shuttle looks completely different when it's upside down. 🙂 This mission looks like a particularly interesting one – not that the shuttle is never not interesting. I especially loved the night launch. "teams of experts will pour over them"
Always wondered what space would look like and how many more stars and galaxies you can see outside Earth's atmosphere, up there, the view must be incredible. And to see 16 sunrises and sunsets everyday, that must be fantastic. The most exciting place in the solar system!